Toshiba wants its new Satellite U840W to be your movie-watching notebook of choice. That's why the company has taken the bold move of giving it a 14.4-inch 21:9 aspect ratio'd, 1792x768 resolution screen, promising to eliminate the black bars from widescreen movie playback. As well as the cinephile pleasing screen, Toshiba has included Harman/Kardon stereo speakers and promises all-day battery life. Unfortunately there's no Blu-ray drive on the laptop so you'll have to download or stream those widescreen films. As an Ultrabook, the Satellite U840W has a Hollywood-starlet's waistline (20.8mm) and premium brushed metal finish, but weighs in a fairly hefty 1.814kg (although this will vary depending on your chosen configuration). Its innards feature a 32GB SSD, 500GB HDD, an Ivy Bridge Intel Core processor and up to 10GB DDR3. We're pleased to see three USB 3.0 connectors feature, while HDMI out, Ethernet and a muti-card reader complete the port line-up. The Toshiba Satellite U840W release date is penned in for Q3 2012 (July – September) with prices starting at £899 ($999). But that's not all, Tosh fans! The company has been on quite the spree, also unveiling the Satellite U840 Ultrabook – a similar machine with a 19.9mm waist and regular 14-inch screen. 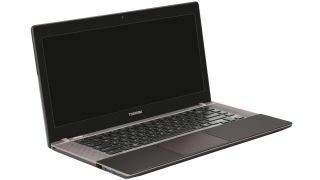 What's more, when it goes on sale in Q3 2012, the Toshiba U840 should be fairly affordable with pricing starting at £599 (likely to be around $699). There's also the Portege Z930, an update to the business-friendly Ultrabook lineup that offers longer battery life and a variety of screen size options. And last but not least there's a full on all-in-one PC known as the Toshiba LX830, enhanced with Freeview and Blu-ray player as well as Windows OS – and the 23-inch HD display comes in a touchscreen option, if you're feeling tactile.